The angle of the roof makes a difference, too. Shallow slopes are not as wind tolerant as steeper pitches. This has to do with aerodynamics and lift. The easiest way to grasp this idea, without an in-depth scientific analysis, is to recognize the fact that many shallow-sloped roofs look almost like the foil shape that causes airplane wings to lift and boat sails to pull their respective vessels up or forward. What we don’t want is for the wind rushing over the tops of our island houses to create a pressure differential that tends to lift the roof.Any roof with the four-sided hip design is at a great advantage over two-sided gabled roofs. Strong winds are much more likely to lift a gabled roof off a building than a hip roof. Having sloping sides all around poses less resistance at any given point, and the wind therefore moves past such shapes, rather than pushing against them. Of course, no matter what shape the roof, the fundamental construction that connects the roof to the house is extremely important. Trusses must be nailed properly. Truss plates and hurricane straps are now required by building code in southern Florida. Bracing a roof and securing decking properly is not expensive and a very good precaution to take in hurricane country such as Anna Maria Island. 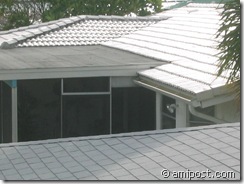 One sees a wide variety of roofing materials used on island homes. Although they are not as elegant as some of the other choices, composite shingles, when properly installed, are often more wind proof than some of the more expensive options. Barrel tiles, for example, are quite likely to be picked up by the wind because of their shape. A far superior choice with a similar look is flat concrete tiles. Metal roofs come in different weights and qualities, and they have the added advantage of being recyclable. They are usually very expensive, however. When it comes to owning a home on an island in hurricane prone area, there are two reasonable, but opposite approaches to the threat. One can build with only the best design and materials, hoping to survive any storm. Or one can keep the home small and inexpensive, to cut one’s losses and replacement costs in worst-case scenarios. In either case, being aware of designs and materials that are appropriate for this region makes a lot of sense.